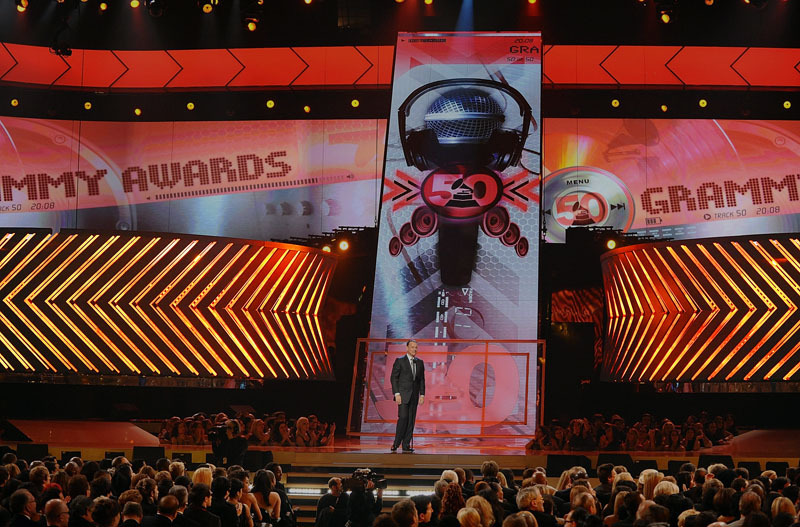 Los Angeles based ShowPro is setting the scene for the upcoming 50th Annual GRAMMY Awards with over 1500 HD VersaTubes™ for lighting designer Bob Dickinson and production design partners Steve Bass and Brian Stonestreet. The VersaTubes are mounted on various parts of the set including stair cases, rolling walls, and a unique mechanical “close down” wall on the downstage edge of the stage. One special performance will feature an array of VersaTubes as chandeliers and uprights. To facilitate the application, ShowPro did a pre-install at Scenic Express, a Los Angeles based scenic shop with the support of VER. The GRAMMY Awards will feature performances by Paul McCartney, U2, Radiohead, Jennifer Hudson, Justin Timberlake, Neil Diamond and 15 other artists. The annual special airs Sunday, February 8 at 8pm et/pt in HD on CBS live from The Staples Center. The 51st Annual GRAMMY Awards are produced by John Cossette Productions in association with AEG Ehrlich Ventures for The Recording Academy. Ken Ehrlich and John Cossette were executive producers. ShowPro provides lighting, projection and video to the special event industry.